Mental health problems are often challenging to diagnose. Depression is a very common mental illness that can be related to many conditions so proper diagnosis and treatment involves discovering the root cause of the depression within a given person’s brain. For example, despite these two patients having the same common symptoms of depression, you can see in the SPECT scans below how radically different the brain activity is in these two depressed individuals. 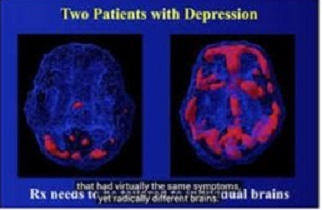 The root causes of these two depressed brains are very different. What would help the depressed person on the left where there is very little activity in their brain is not what would help the depressed person on the right whose brain is overactive. These are reflections of only two of the 7 possible brain patterns one sees in depression. Anxiety and depression are closely related. Amen Clinics often views these two mental health issues as two sides to the same problem, categorizing them together into 7 types. at rest and one during concentration. deficiencies, hormone imbalances, toxicity, etc. – Counseling tailored to help you use your brain to heal your depressed brain. Identifying your symptoms of depression and anxiety is the start to finding the root cause. If you are suffering from depression I look forward to the chance to work with you to create an enjoyable future.